Wheatgrass and barley grass are green plants associated with numerous health benefits. Many of the proclaimed benefits lack scientific evidence. Proponents of both plants, however, believe that they contribute remarkable amounts of vitamins, minerals, fiber and chlorophyll and can significantly enhance wellness. Consume fresh and juice-forms of wheatgrass and barley grass as part of a balanced, nutritious diet for best results. Discuss your dietary goals with a qualified professional. Barley grass and wheatgrass are believed to provide rich amounts of vitamins and minerals, many of which are antioxidants. According to "Dr. Gillian McKeith's Living Food for Health: 12 Natural Superfoods to Transform Your Health" by Gillian McKeith, M.D., barley grass contains all known minerals, including eleven times more calcium than milk, five times more iron than broccoli and seven times more calcium than orange juice. Wheat grass may provide similar nutritional benefits. Though wheatgrass and barley grass should not substitute fruits and vegetables, they may enhance your overall nutrient intake. The benefits of vitamins and minerals are vast and include enhanced immune system function, cell production, eye health, physical development energy and metabolism. Chlorophyll, the substance that gives wheatgrass and barley grass their green color, may provide numerous benefits. According to McKeith, chlorophyll has been linked with cancer prevention, healthy blood production, bodily detoxification and improved wound healing. Chlorophyll may also provide antioxidant effects, which enhance immune system function and may help prevent or reduce the severity and frequency of infections, viruses and diseases. Chlorophyll may also help your body combat illnesses more rapidly and reduce the need for medical treatment. 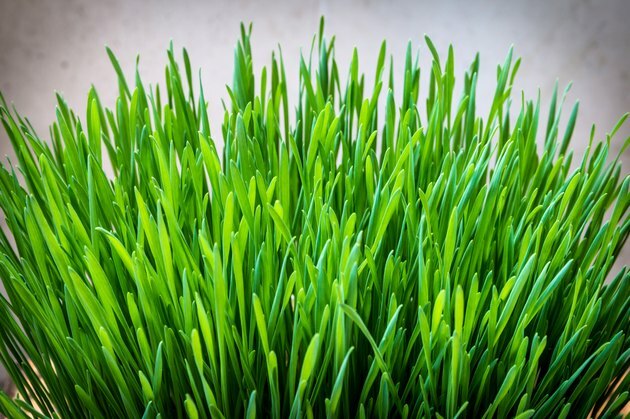 Wheatgrass and barley grass contain digestive enzymes—substances that help reduce toxic and indigestible materials in food. According to McKeith, barley grass juice may help improve symptoms related to stomach ulcers and other digestive conditions. Digestive enzymes may also improve wellness in people with celiac disease, indigestion, food allergies, Crohn's disease and gastroesophageal reflux disease (GERD). As fiber-rich foods, barley grass and wheatgrass can support digestive function, enhance fullness between meals and help prevent or reduce constipation. Go Ask Alice! : Is Wheatgrass as Groovy as They Say it is?